There are many factors which can have impact on the successful results of laser hair growth systems hats and helmets. One of them is whether the person intending to use the device is the right candidate. Check below to learn who is the right candidate and who is not, for these laser light therapy systems. In order to see effective results, the hair loss and thinning should be with in the system’s capability. If a person has a bald hair for ten years, even the best helmet will not be effective. 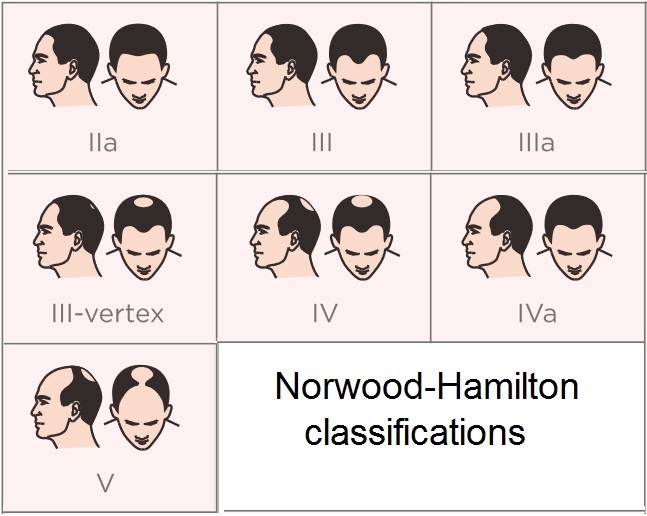 Most devices are effective for reversing beginning patterns of hair loss. These can be seen in the images here on the right. 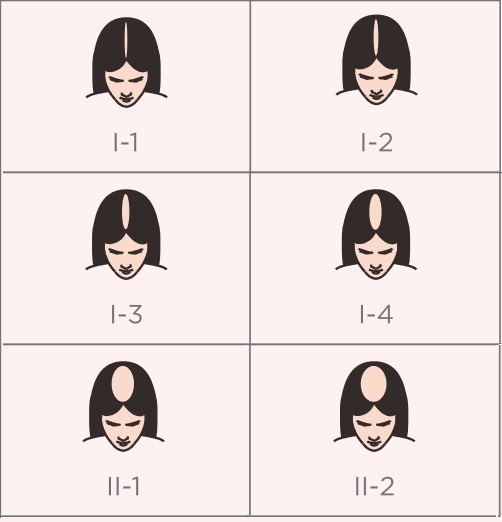 Women hair loss is usually seen as at the top of the head, as more skin is seen when parted. Another very common way of women hair loss, is when the hair is shedding thin all around. 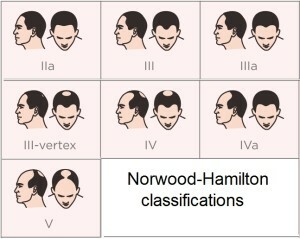 Men hair loss has common patterns as can be seen in the image. Usually the forehead line retreats and the top of the back of the head get thinner until no hair grows there at all. The best hair growth laser helmet can simulate shrinking follicles for these classifications. But its not a ‘magic hat’, and more advanced balding patterns will not see effective results. The hair follicles must still be alive, otherwise laser therapy may not be effective. The FDA cleared the home laser hair regrowth devices only for fair skin people. The reason is that during the trials dark skin was not tested and there is not enough evidence it is safe. There is no evidence it is not safe either, but the FDA does not cover that. 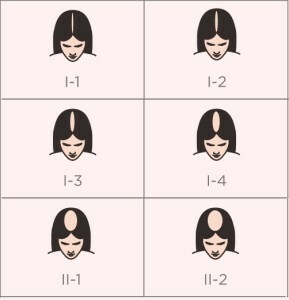 The laser hair growth candidate is those with the skin tone similar to the four tones on the left. 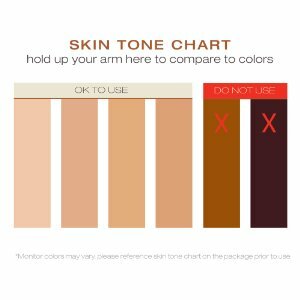 Those with the darker tones (dark brown and black skin) haven’t been tested to clarify the safety. The issue about dark skin and laser is because laser light can turn to heat when beamed over dark matter. Do not use if you are taking medications or if you have any medical condition which makes your skin sensitive to sun or light. Do not use such device if you have cancer on your scalp. Do not use device if you have sensitive skin an itchy sensation of the scalp or sunburn like redness. There are several home systems designed to use the LLLT technology (low level laser therapy) for rejuvenating the hair growth. Some of the systems get lousy reviews, and others have inferior features and specs. One device which stands out comparing the other solutions is iRestore Laser Hair Growth System. It is not the best system, there is one system with better specs that cost $1999…There are others at the $800 point, and the iRestore Laser which is under $600. Click here to see what other customers are saying about the iRestore Laser Hair Growth System. The iRestore Laser Hair Growth System gets high rating and reviews with 51 light spots when used properly can achieve hair growth stimulation. It comes with a SIX months satisfaction guarantee, which we believe eliminates the risk of giving it a try. Make sure you use the helmet when your hair is rather short. If the light can’t reach the skin because the hair is blocking it, then you are just wasting your time and money. Good luck! This entry was posted in Capillus, Hair Growth Helmets, iRestore and tagged Capillus 82 Laser Hair Growth Cap, iRestore Laser Hair Growth System, Laser Hair Growth Comb, Laser Hair Growth Hat, Laser Hair Growth Helmet, LLLT, LOW LEVEL LASER THERAPY by . Bookmark the permalink.